I’m so sorry to all of the people who have been wanting updates on how it’s all gone. We’ve been spending so much time on getting the bus ready to move in, then moving in, then dealing with all of the things we didn’t think about before we moved in, that we’ve neglected to update the blog post. So, to keep it short, we moved in around the end of February, and we’re now experiencing our first winter in the bus. It’s…bracing. However we feel like we’re becoming more resilient and in touch with our surroundings. After all, when you live in a bus, the outside environment is never more than three meters away at any given point 🙂 I’m sure you’re all waiting for some pictures anyway, so here they are! So, to some photos of the inside. I’ll keep them big so you can see. First off, the kitchen. The first one is just as we moved and the remainder are after we put all of our stuff in. Next are our sleeping areas at the back. We’ve made some really cosy places and with the block out curtains up, we stay really toasty at night, even in the 1 or 2 degree winter nights we’ve been having. This is our queen bed for B and me at the back. The girls both have a single bed. Below is the side view of our big bed, with the little medicine cabinet that is on the shared wall between our bed and I’s sleeping nook. So then on to the girl’s beds. Q is only with us for one weekend a fortnight, so for the time that she’s not here, her bed becomes a play area and a place to keep stuff prior to putting it away, like clean washing etc. Under I’s sleeping nook are tubs that contain all of our clothes. Q’s bed platform is on hinges, as is our queen, and there is storage underneath. 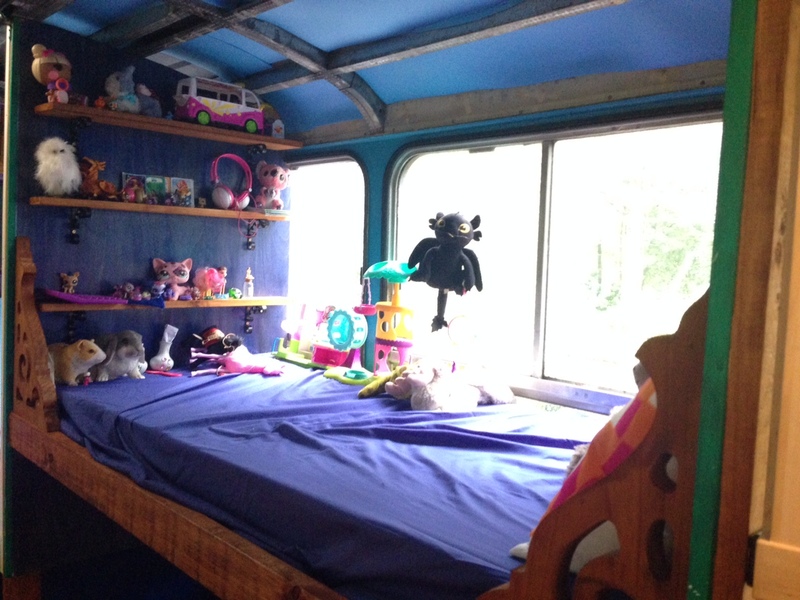 The girls have all of their toys in tubs that stay outside under a marquee, that you can see through the window of our bedroom at the back of the bus. They’re allowed to have one or two (at the most) tubs inside at any given point and if they want to bring a different one in, they have to take out the earlier ones. You can see a couple of tubs on the floor of the living space in the picture above, as they were playing with them at the time. However, normally the walkway is clear, apart from having to step over Snowy the German Shepherd. It’s a big change from their bedrooms being strewn with toys at all times and us having to pick our way through. They’ve adapted really well though with a minimum of pouting. Below is a close up of our comfy couch, which doubles as another bed, should someone stay over. It’s where we spend a lot of our time this winter and fits all of us on there for watching movies or listening to music. It’s a pretty nice cuddle-space. We’ve been doing a lot of thinking about redundancies. As we hope to be off-grid completely by the end of the year, and we spent quite a few days last winter without power due to storms bringing trees down and knocking out power lines. In our modern, three bedroom house we were freezing. No electricity meant no lights, no cooking (it was an electric stove), loss of all the things in the fridge and freezer, no heating as even though it was a ducted gas system, without electricity to power the fans, it was useless. So, whilst we’re still on-grid due to one 10amp power lead coming into the bus, we’re currently off-grid for water, thanks to an enormous water tank near our bus, off-grid for gas as we only use a small gas-bottle that powers our stove and cooktop. Within the next month we plan to install a tiny wood stove for heat and our 24volt bus batteries currently power our fridge/freezer and our LED lights. We’ve lost power briefly a couple of times already this winter but our lights and fridge stay on, so we barely noticed. So, once the heater is installed, we’ve only got our solar array to sort out by next winter and we should be completely off-grid and not dependent on anyone else for our basic needs, energy wise. Energy sovereignty is quite important to us. You can see our lights in this picture below, which also shows how cosy the bus is at night. One of the most recent improvements to our comfort has been to replace the bus doors a couple of weeks ago with a proper door. The original bus doors didn’t seal properly so we were just bleeding heat out at night and also Snowy would barge her way out in the middle of the night to go hang out with the wombat that lives near us and then the doors would be open until one of us stumbled out to shut them. So, I sourced a beautiful old solid cedar door from Gumtree and we had it installed, complete with a dog door for Snowy to come in and out as she chooses. I’ve since painted the wood around it white to match the bus on the outside and we’re paneling the inside with our pressed metal so it looks very medieval. We noticed a great improvement straight away in our heat retention. So all in all, the transition to tiny living has actually been easier than we envisaged. We had to get rid of sooooo much stuff, and we’ve vowed never to accumulate so much crap again. We know where everything is now, it all has a place and every weekend sees us putting more things away that we thought we were going to need but found out we didn’t. We feel secure that we have a comfortable home (with wireless internet so we can still use all of our gadgets) and are well on our way to being as self sufficient as possible. It gives us more time to spend with the people we love and engage in our community as we’re not trying to service an enormous mortgage or paying a large amount in rent and we feel a deep sense of satisfaction, sitting together on the couch late at night, after the girls are asleep, drinking a glass of wine and looking around the cosy space we’ve created. If you’re thinking of doing something similar, we’d say go for it. We don’t regret it in the least. the back. I’ve also painted the sliding toilet door blue, which you can’t see from this shot. Since then, we’ve sourced a laundry sink to go in the kitchen for use as the kitchen sink because it’s a lot deeper than most kitchen sinks (so I have more of an excuse to let the dishes pile up) and I’ve spray painted that the same cobalt blue as the kitchen cabinet and toilet door. I’ve also continued the pressed metal backing all the way to the back of the fridge, and finished painting the window frames in a rust guard hammered copper finish which makes quite a difference, I think. 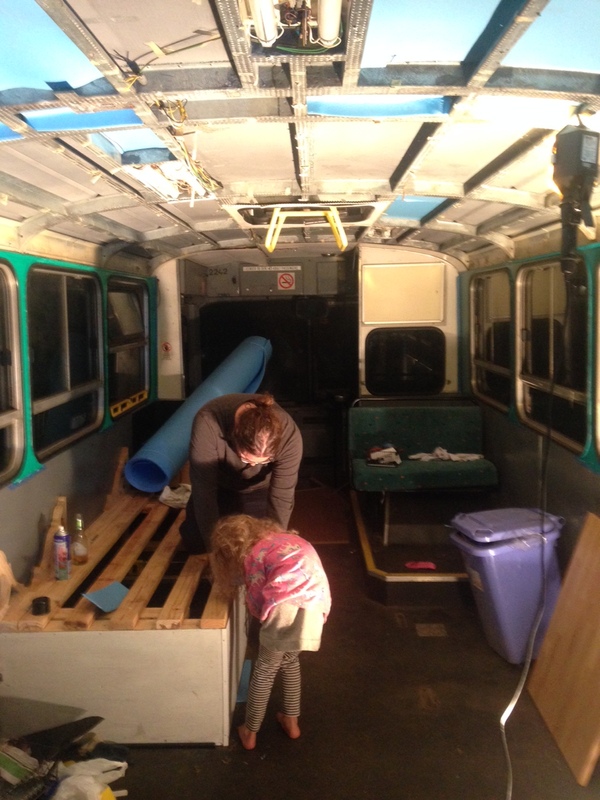 So we finished the shelving yesterday, and then installed some strip lighting LEDs along the underside of both sides of the bus, which can be warm white, cold white or any other colour you can think of, for when bus dance parties are required. We had one yesterday afternoon to celebrate finishing the shelves. What better reason do you need? We also had a nearly new queen mattress delivered yesterday morning from a gentleman from Gumtree who was happy to deliver it so now our bedroom is nearly complete and very very cosy. We’re just about to work out the reading lamp situation and where they will be situated. We obviously want LED lights and 12v or 24v but most of the ones I can find are really modern looking and don’t really fit in with the kind of gypsy/Moroccan decor thing we’ve got going on, so I will keep looking. Perhaps I’ll have to get some and paint them with my hammered copper paint and hope they look more steampunk than modern. We moved the shower back in yesterday so we can mark it out for plumbing. I’m hoping we don’t have todo that too many more times as it’s pretty bulky in such a small space. 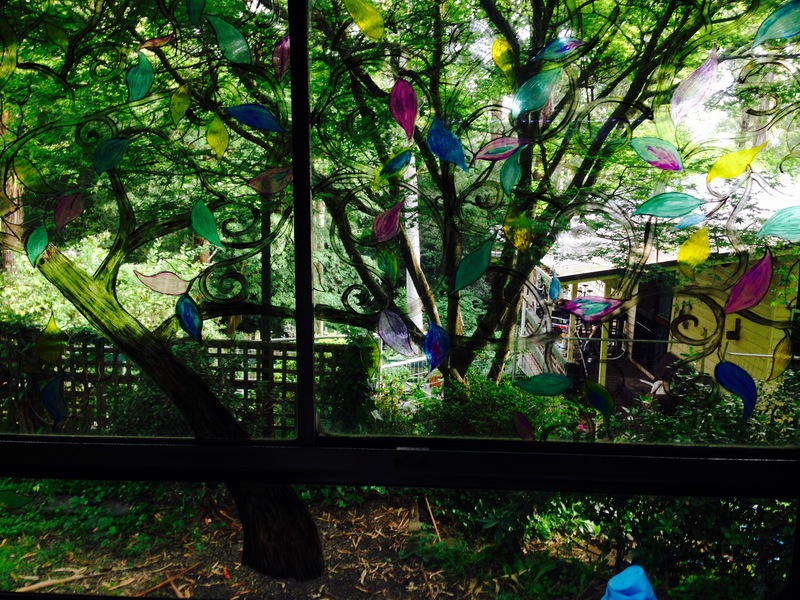 I’ve included a picture of the glass painting I’m doing on the toilet window for privacy but it’s hard to get a clear picture of it with the light outside and all of the greenery we’ve got. It’s a stylised tree with different coloured leaves and I think it will work well when it’s finished. It’s all experimentation as I’ve never done any glass painting before. Hopefully it won’t be so long before another post. Byeeeeee. Spring is here! There’s life in the old girl yet. I can’t believe it’s been so long since I’ve made a post. Apologies for those who have been asking for updates. We have been plugging along this winter but by the time we get home from work each day, it’s dark and freezing so all we’ve wanted to do is curl up on the couch and stay warm. Anyway, I’ve just taken some photos today of what we’ve been working on. our local bank in order to buy a solar system so we can be energy independent and decided on building a trailer to house the system so that we can in hot summers, park the bus in the shade and keep the trailer out in the full sun but after doing our research, it seems that many believe that with the release of the Tesla Powerwall in Australia next year, the prices of other battery off-grid system is going to drastically reduce in order to stay competitive so we’ve decided rather than spend our money right now, we’ll just wait a little longer until we’re closer to living in the bus full time, and see what the offerings are then. One of the benefits of looking into solar now, has been to map what our required energy needs will be once we’re in the bus, which required us to look at all of the appliances we’ll be using and estimate the amount of time each week that they’ll be running. This allowed us to gain an understanding of what size system we’d need, with around three to four days battery back up for these cloudy Melbourne days. Other than the fridge (which is 12v, 24v or 240v switchable) the biggest draw was going to be the heating element in our Sunmar composting toilet. However, we just discovered that here in Australia, most people turn the heating element in their Sunmar off, as it’s really for extra cold climates. That’s going to save us a lot of energy draw. Hooray! Anyway, on to the other things we’ve been doing! We’ve had Luke our wonderful carpenter out again and he’s built us toilet walls and a sliding door. We needed to take the shower out in order to cut the front lip down so it will sit flat, so you’ll just have to imagine it back in there in the pictures, between the toilet wall and the couch. 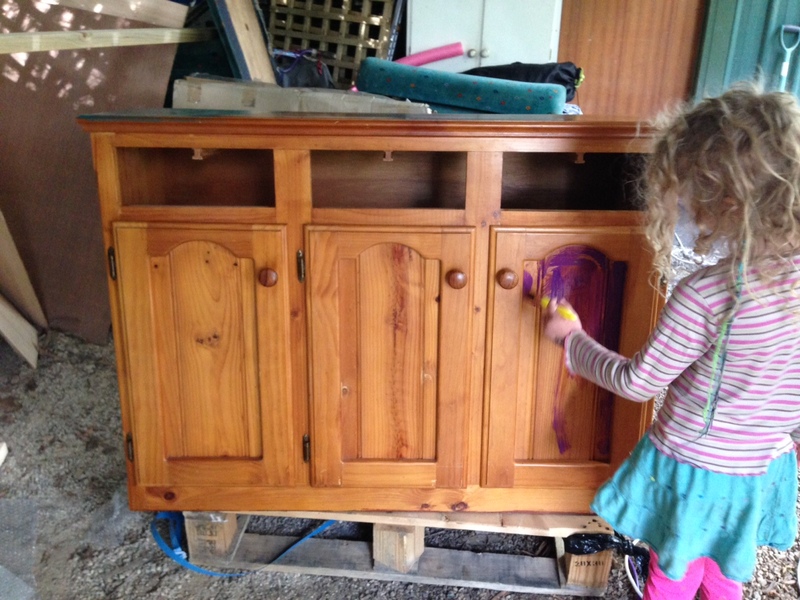 He’s also built us a little cabinet for the Thetford oven that I found secondhand but never used on Gumtree for $500. Normally they retail for $1200 or so, so it was a real bargain. It’s gas but has one 12v electric burner so if we happen to run out of gas we still have one burner to work with. It’s also got a full oven and grill so we’ll have all the options to cook still. I found some awesome panels on ebay that we’ve used to line the old grey on the walls. They look like pressed metal but are actually vinyl so they’re super light and I was able to just stick them on with glue. We’ve got some copper ones and some purple/green and if we get sick of them at any point, we can just pull them off and put up something else. We’re planning on getting some in white and using them as the ceiling once we’ve done the wiring and insulation in the roof. Plumbing in the shower, kitchen sink, and gas heater and oven is the next job. Then wiring and insulation and then the bamboo flooring that we’ve bought ready to go once we’ve finished construction. Once the plumbing is done, Luke will come back and fill in the final walls on the toilet and between the shower and couch, add some curtains and we’re done! Until we get our solar array, the appliances will be wired for 240v and we’ll just run a power line in, like we’re doing now. Oh, and we’ll be installing a diesel heater (we think) that will run directly off the petrol tank and be ducted from the bedroom to the living space. Eventually an airconditioner in the back skylight will complete our thermal comfort needs. Since the last blog, we’ve finished off the bedroom apart from the ceiling and curtains, and a mattress for B & I. The girl’s are sorted though and Indi has already populated her shelves with some of her toys. We’re asked every weekend if we can have a sleep out in there but without the insulation or curtains yet, it’s been a bit cold. They are bright and happy places though and the girls play in there for ages. B has also made a door between the bedroom and living space so they shut that and tell us we’re not allowed in there. Fair enough. 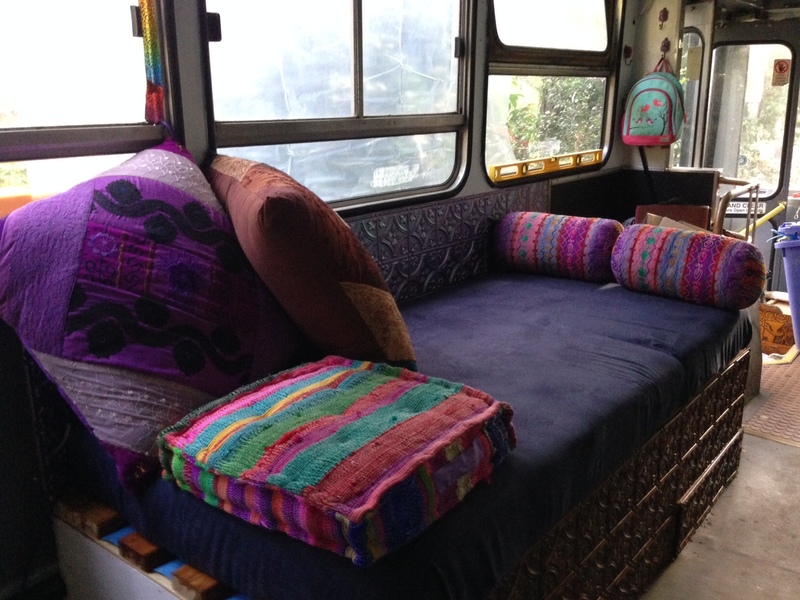 We’re sure that there will be challenges with us all living in such a confined space but the fact that our pack always wants to be within arms reach of each other anyway, we’re pretty confident that we’ll really love living in the bus. We can’t wait. B has realised that he has awesome carpentry skills and we feel much more capable to tackle a lot more of the work ourselves. So, since the last blog update, the couch has been finished, the bus seats have been recovered with some dark blue microsuede material that I’ve been dragging around with me from house to house wondering what to do with it. We’ve built a table with storage from the aforementioned ikea table and got a secondhand sideboard for $50 which I am in the midst of painting to use as part of the kitchen cabinetry. Oh, and tonight we picked up a front loader washing machine which will make up part of the kitchen. So, for the kitchen, all we need now is the fridge and the oven/cooktop. 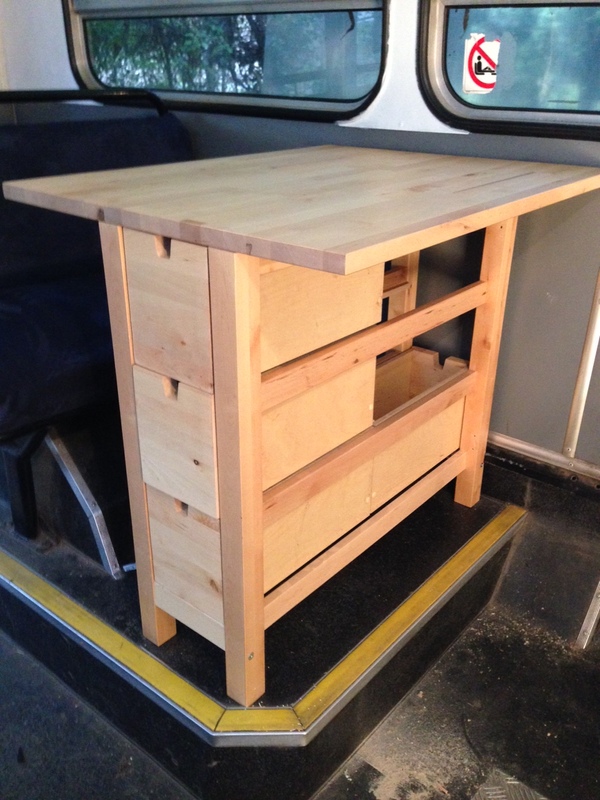 Here is B’s awesome table with storage that sits in front of the old bus seats that will be installed with seatbelts and used for travelling. It means that Indi could sit there when we’re driving and do colouring or work on her laptop or whatever. It’s also another workbench that could be used for kitcheney things. Of course, once we have all of these things, we have to plumb/install them. That’s going to cost a bit as we don’t have any expertise in that, but that’s ok. We’d rather have them in properly. This is the sideboard when it arrived. Indi helped me paint it bright colours with the paint that we had lying around. I’m painting it a solid royal blue over those bright colours and then sanding it back to give it a distressed look in places so those colours shine through. I think it’s going to work really well and add some nice colour. You can see the bright colours in the next photo. In the photo at the bottom, you can see the front loader washing machine and next to it the sideboard with the first coat of the royal blue. 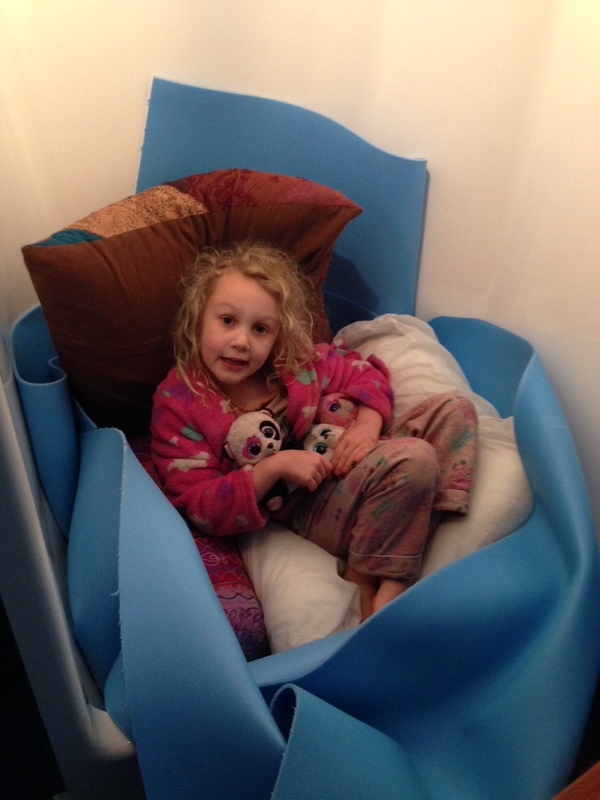 And finally, Indi making a nest in the shower with the foam we’re lining the ceiling with, the cute button. The shower arrives! And of course, more painting. This weekend we picked up our shower stall and with much trepidation maneuvered it into the bus and hooray, it’s fits! It’s too wide to face toward the toilet, it would stick out into the walking space in the living room too much, so it’s going in sideways and we’re going to build a cool little surround for it. It’s a high step so it already has a step tha t’s 250ml high to step in, which hopefully will help with reducing any splash into the living space, and we may increase this with the surround. We plan to install a strip of LED lights around the top of it otherwise with the curtain shut, it would be quite dark in there but now that we have that, and the toilet, all that’s left in terms of build to do is the kitchen. Of course, we have to get them all plumbed in but as sheer luck would have it, directly under the floor of the shower, there is room for the water tanks, so it should be relatively simple to plumb it all in. The shower comes right up to the built in couch so will create a wall to lean on (and maybe hang a family painting that we love) and the other side will be the wall for the toilet. Taking it all the way up to the couch gives us more than enough room to be able to open the draw of the composting toilet and will hopefully stop us feeling too cramped in there. We plan to make a pocket door that slides back in to the wall to get in to the toilet and that pocket wall will be lined with shelves, or even a door for a really narrow pantry, one that is only about a mason jar or can size deep. So, we’ve been thinking about how we’re going to do the kitchen and we’ve come up with an idea (thank you Pinterest!) 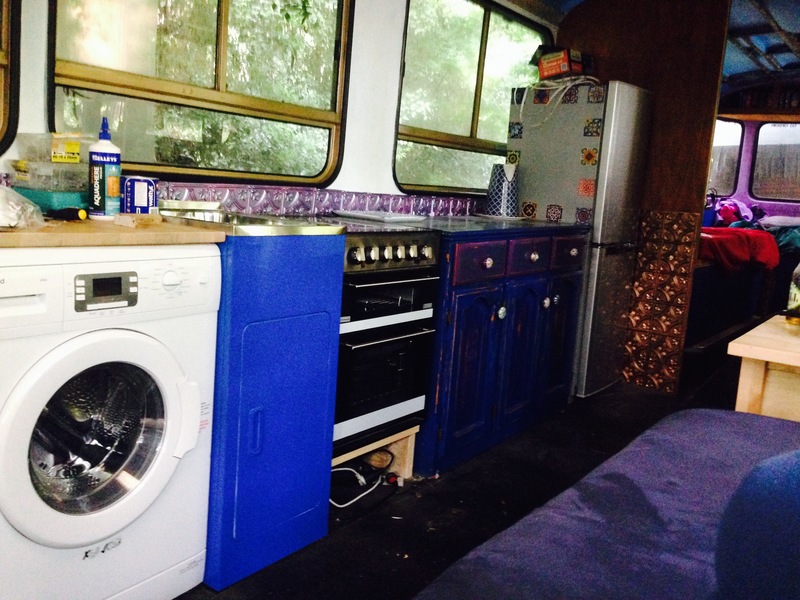 Instead of finding a kitchen on ebay or gumtree and trying to install it, I’m going to source a couple of cheap secondhand cabinets, dressers, or sideboards and paint and distress them to give us our gypsy, shabby chic feel and convert them into use as a kitchen. One of Indi’s beside tables was used as a guinea pig and got a painting and a sanding over the weekend. It’s no longer stained and grubby rosewood but now royal blue with turquoise and purple paint showing through where I sanded it back. It’s actually really kind of pretty now. I guess I’ll need to do the other one so they match at least. But anyway, it’s a relatively simple process and really kind of effective. I’ll post a picture of it if I remember. 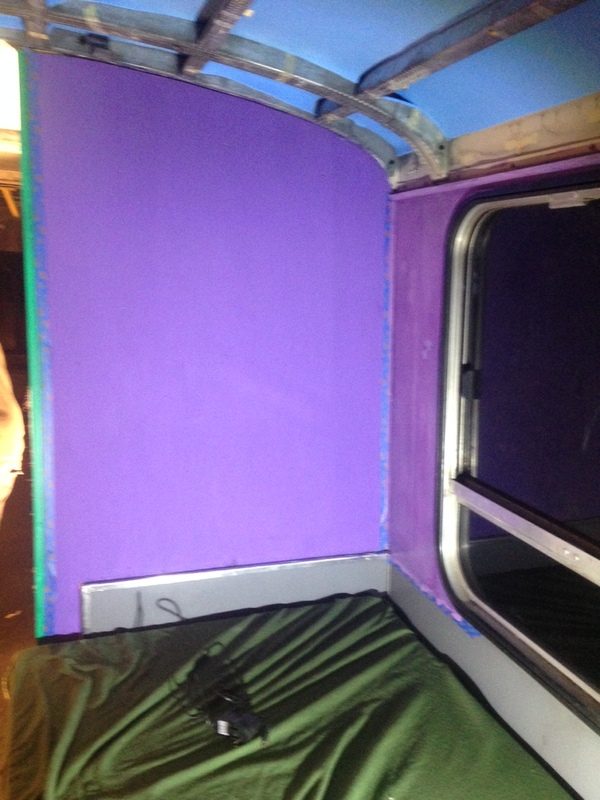 So, in light of this brainwave, we decided that the green walls in the living part of the bus would be overload if the cabinetry is going to be colourful. So, they got another coat of primer and two coats of plain flat white. Given we couldn’t decide what green we liked anyway, we’re happy with it and we’re aware of keeping the bus as light as possible given it’s such a small space. 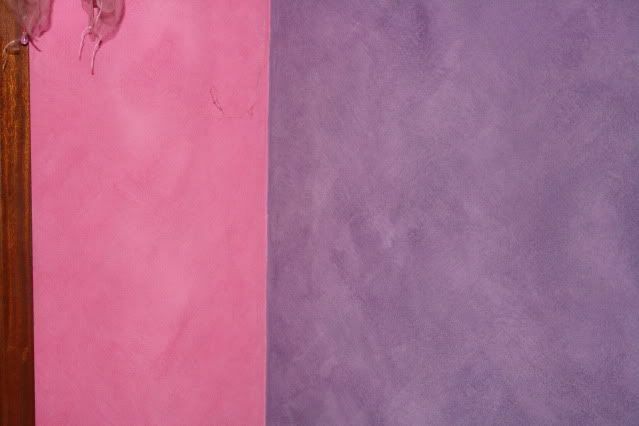 It took a whole week for the purple suede paint in the bedroom to dry – it’s just so cold and wet here at the moment, and it only dries if I put the little heater on in the back room. However. when I do put the heater on, it’s amazing how toasty and comfortable it gets in the back part of the bus. It makes us feel quite comfortable about how easy it will be to heat it when we are living in it full time. Although the paint has come out a little pinker than we would have liked (I am still struggling to admit that it is, in fact, quite pink and will only go so far as to say it is ‘pinker than I imagined’) we are happy with the effect and it does hide the brush strokes that I was unhappy with earlier. And I like i t MUCH better than the sponging that I did. That was a total fail. Apart from getting a mattress for our bed, finishing off the bookshelf above us (which Luke will need to do as the wall is curved and we have NO skill in attempting something like that) and putting up curtains, the bedroom area is pretty much liveable. At this stage we’re still running power in through an extension cord but so what – THE BEDROOM IS NEARLY DONE! We’re a little excited, you may have noticed. These photos don’t do the cosiness justice. As B and I were sitting on the couch last night, after a lovely weekend with the girls, watching things about tiny houses on youtube, we were both filled with a sense of rightness and wellbeing. There is something profoundly satisfying about crafting the place you will live with your own hands (as much a fitting out a tin can will allow) and every day brings with it more certainty that we are doing the right thing. Whilst being mobile will be really awesome, chances are we won’t really go too far for too long (although that idea is subject to change). However, the knowledge that we will have a safe and lovely place to live no matter what happens to us in the future allows us to make the choice of what we really want to do with our time. We both really love the work we do, and plan to continue it in the future but the knowledge that I won’t need to work full time up until my 70s just to afford a mortgage on a house that we can’t afford to spend time in because we have to work so much is really reassuring. As we minimise our lives, we find that, as many people have said, divesting yourself of stuff is really freeing. We are really working on the premise that if it’s not beautiful and useful, it doesn’t have a place. We just won’t have the room for stuff we don’t need – and boy, do we have a LOT of stuff to get rid of. The auto electrician who came out to talk to B last week about our power needs and the best solar system to use laughed at the fact that we insist on having our (admittedly tiny) coffee machine and our kitchen aid as non-negotiables but are happy to forgo a microwave and toaster (real energy suckers). We are making the decisions on our lives and the way we live them, rather than what is usual and just taken for granted as a necessity. Once you start questioning what is really necessary for you to live a happy and productive life, it gets easier and easier to let things go. Less stuff in your life leaves more room for experiences and love, at least, that’s what we’re finding. This weekend felt in many ways like we got heaps done – and also that we got nothing done. One of the difficulties of trying to create a tiny house when both grownups work full time is the limited time we have to actually do the work that needs to be done. Between enjoying slower mornings than week days, getting Indi to karate, various birthday parties and just keeping her from being bored, taking dogs to the park to get their crazies out, and the fact that in winter the daylight is gone by about 5.30 (and it gets COLD) sometimes it doesn’t feel like we get any time out in the bus. 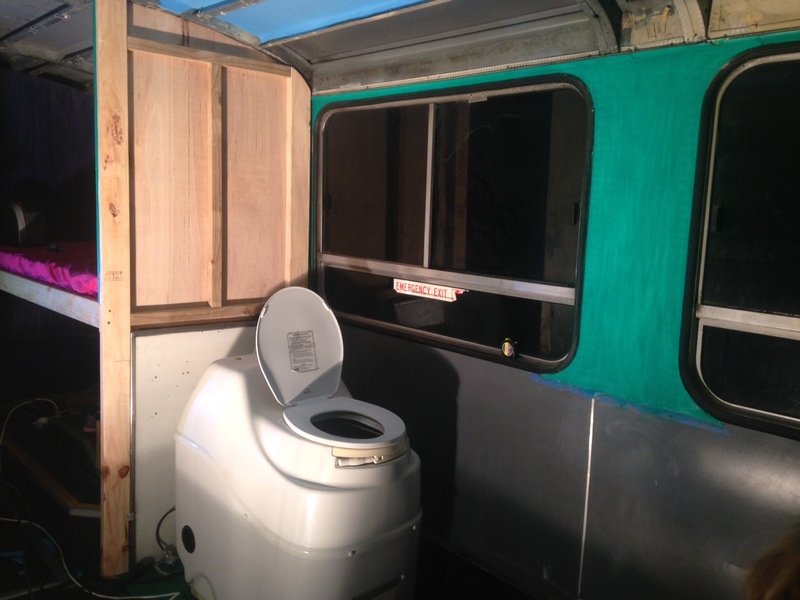 Having said that, this weekend we went and had a look at a shower stall just to measure it in person to make sure it really will fit in the bus, given that the roofline has that distinct curve that all buses have. I really like that curve – it makes it look like a gypsy caravan (at least in my mind) but it does have it’s challenges when trying to built infrastructure or fit in things like shower stalls. 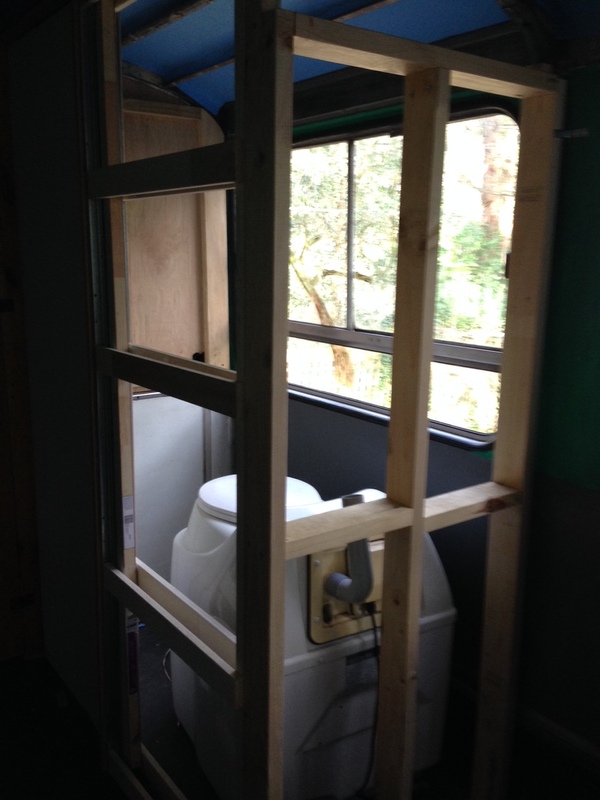 I was originally planning to custom make a shower stall, and that’s definitely something that people with any kind of skill with that kind of thing could do, however, we don’t and at least with a fibreglass pre-fab, there is a much reduced risk of leaking from dodgy seals as it’s all in one. So, we did find one that we’re pretty sure will fit, and it has a higher than usual lip to step over to get in, which we think will help with splash getting out in to the bus and also could be a little bath for the girls to sit in. There should be new stock in this week so hopefully we can get it all happening this weekend. Then Luke can come back and make the walls for the bathroom and there’s that done. I can’t sing the praises of the Sunmar composting toilet enough (yet) in that we don’t have to worry about blackwater plumbing. Not only does it mean we don’t have to have to purchase and install another tank with the associated plumbing, but we also don’t have to worry about finding pumping stations to dispose of it. Gross. All we need to do is connect a vent out from the ceiling or upper wall (we don’t want people walking past to have to smell it) and two power connections, one for the fan for the vent and the other for the heating element that desiccates the waste down to a fine powder, and we’re done! Of course, the whole unit is a lot larger than the usual toilet as it’s all in one, which is definitely a consideration. 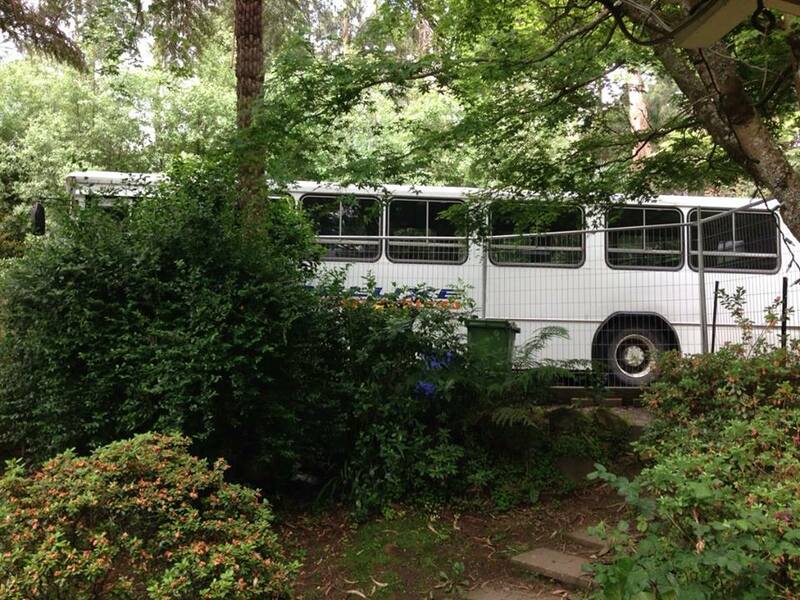 If we were making something smaller than a bus, it probably wouldn’t be feasible but for us, we think it’s workable. We plan on building storage steps along the side of it to help the small people climb on up there and also, you always need more storage in a tiny house. Plus, although it’s awesome, it’s not the prettiest thing. Brad vetoed my half-baked idea of painting it. Sensible man. 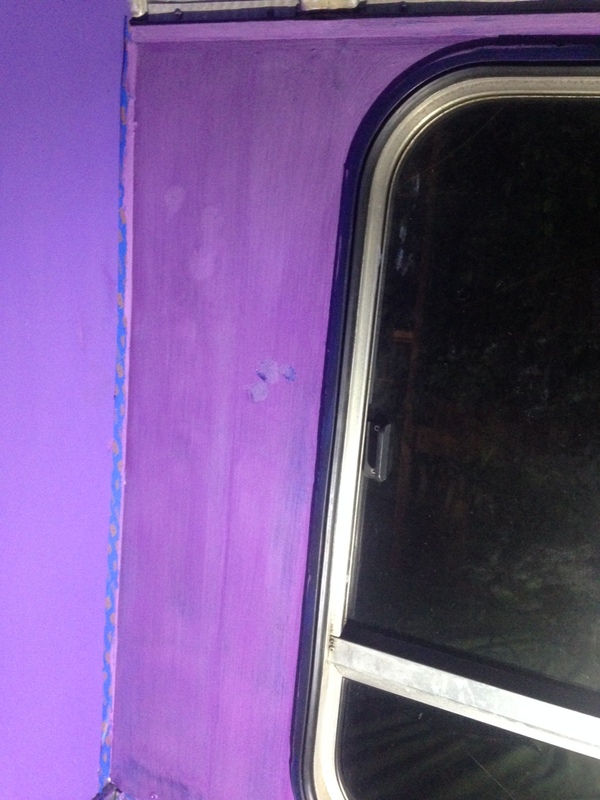 Speaking of painting, I mentioned in the last blog post that I thought that I might really dislike the sponged colour in the bedroom area of the bus at the back. Turns out, I was right! Well, it’s not that I disliked it so much, more that I didn’t love it, and I thought ‘Well, I will have to look at this wall when I first wake up for potentially quite a few years. Do I want to wake up grumpy because it bugs me?’ And I decided that for the longevity of my marriage and happy family life, I didn’t 🙂 So, I changed it. I went out and got some suede effect paint because the brush marks of the previous owners is still quite visible under the paint and I wanted to hide that. So, off I went on another painting frenzy, to the exasperation of Indi who stated ‘You’re aaaaalways painting the bus!’ Quite right too. So I painted away on Friday night after work and then another coat on Saturday. I went in on Sunday thinking I could potentially do a final coat, touched the wall and it appears thatpaint doesn’t like to dry in Winter. It’s still extremely wet, so much so that my fingers not only made a mark in the paint, they actually slid across the wall smearing it, which you can see in this picture. Great. So, I contented myself with how awesome the chalkboard paint has come up on the bit of wall that we were unhappy with earlier, and it still has another coat to go as well. On the way home from children’s birthday parties we stopped into Clarke’s Rubber to get more of the foam that we’re using for the vapour barrier for the roof of the bus and Brad got to work cutting it to size. The roof has a whole metals structure which will be good for attaching the ceiling when we’re ready but does mean that each piece of insulation and barrier needs to be cut to size. And of course, it appears that not many of them are the same size so Brad hasn’t been able to just make a template and cut them all, he has to measure and cut each piece individually. He then uses a spray adhesive (stinky!) to attach it to the roof but we think it will really be an invaluable step to keep the insulation dry. As it is so cold and wet at the moment, nearing night time, we can really see moisture beading up on the inside of the roof that doesn’t have the blue foam. The foam we’re using is just the same stuff that you can buy to put over your spa or pool to retain the warmth and it’s water proof. We’ll be installing little vents along the upper walls as well to try to keep the moisture out as well. I suspect it will be a delicate balance, keeping the inside temperature and moisture levels pleasant, living in a large tin can. Lucky Daddy has such a good little helper. So, next week, hopefully we’ll have a shower to show you as well. So exciting! So, we painted the walls o f the sleeping area a teal/turquoise colour, as we were originally going for a Moroccan kind of feel but once it was done, I felt that it was a bit stark. Also, given that whoever had the bus before us painted the entire back area with a brush, all of the brushmarks were still visible and I didn’t really like the look. So Indi and I decided we would sponge the same cobalt blue of the cupboard space and bed frames over the teal. Then, we went for a jaunt out to the hardware store and bought some purple to go over that. We sat on our beds for a while looking at it and I thought ‘you know what? I think I hate this’. After a period of time, I realised that once the bookshelf goes up the top, and some wall cabinets go on the side, only a small amount of it would be visible and perhaps it wouldn’t be so bad, but I am still feeling like we would get sick of it pretty quickly. I think I’d rather sand it back and paint it with that suede effect paint, which would hide the original brushmarks, but not give such a full-on effect. Probably like the purple below. I feel another trip to the hardware store coming on! So, the next big item to complete, rather than screwing around with painting and prettifying, is to work out what to do with the bathroom area. We’ve measured up the space between the sleeping area and the front couch, and if our measurements are correct (a dubious prospect), the we should have enough room for the composting toilet (which has arrived and is WAY bigger than I expected but super awesome), a fibreglass shower cubicle (that needs to face into the centre of the bus as the depth of them would jut out too far into the centre) and a little set of drawers that can be used on the other side of the shower wall as a side table to the couch. I happen to have bought an Ikea folding table with centre draws a while ago with the idea that it could be used as a dining table in the bus but that didn’t work out, however we’re going to pull it apart and use the constituent bits for various things around the bus – and it seems to just fit right as the side table to the couch. Vindication fo r an impulse buy. You’ve gotta love that! We’ve found a shower cubicle that we think will fit so on the weekend we’ll go for a drive out and have a look at it, just to make sure. Of course, we’ll have to build the internal walls to go around it but I’m sure we can get Luke back in for a day or so to do that, and get it plumbed in. However, once that’s done, it’s only the kitchen to do, and internally at least, we’re ready to rock and roll! See what I mean about the sponging?